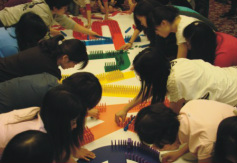 Domino Madness Teambuilding starts off with a blank canvas and allows participants to add their creativity and ingenious manipulation of the tiles to create a breathtaking maze of colour and design. As a participant you will work with your team to create your own design of maze and our unique supply of mechanisms adds an endless opportunity of twist to your structure. However, expect despair and frustration as you work to ensure a seamless flow in your structure! Surely this sounds like a day in office? That's exactly what we want, to replicate in this teambuilding program and allow participants to learn on the importance of teamwork, resource management, planning skills and communication process. Whats guaranteed at the end of the session? A great sense of fulfilment on seeing each tiles fall as plan and opening up a canvas of teamwork and achievement for the whole team. Distance Traveled: As far as your creativity brings you! "The frustration of resetting the tiles after each accidental fall surely brings out the need in team spirit and team motivation. Achieving the end result as a team? A beautiful memory for the whole team."